Home What is GROW Model And How To Use it in Presentations? When making presentations related to growth, success and career or corporate coaching one should always try to keep things simple, instead of focusing on a complex string of aspects which might end up confusing the audience. One way of focusing on the core goals of such a presentation is to use the GROW model. 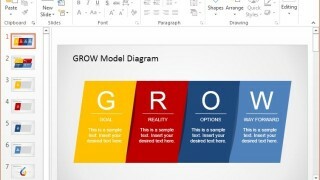 In what is to follow, we will show you how to use the GROW model in your presentations. 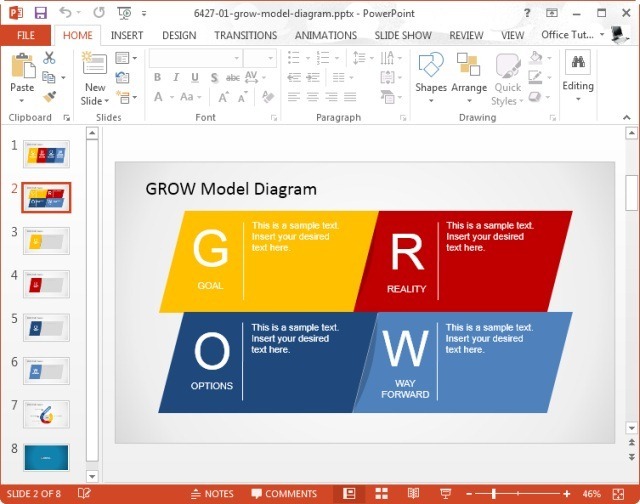 To make your task even more easy, we will also provide you with an overview of the GROW Model Template for PowerPoint that you can use for making GROW model presentations. The GROW model consists of four elements, i.e. Goal, Reality, Obstacles and Will. Let’s explore all of these in detail and see what they stand for. Goal: This is considered as the end point, or the aim that is to be achieved. The goal should be clearly defined and clear to a client. For example, if a client wants to get in shape and lose extra weight, the goal can be, say, losing 20 pounds. Reality: This refers to the current reality is where the client stands at the moment. This also takes into account the current issues and challenges. Sticking with the example of weight loss, we can assume that currently the client might be 20 pounds overweight and has very little stamina for exercise. Furthermore, the client also finds it hard to control eating habits to avoid junk food. Obstacles: If there were to be no obstacles in reaching the goal, the client wouldn’t need help. Getting past obstacles is a major requirement to achieve desired goals. For example, an obstacle for losing weight might be habits like binge eating, laziness and an uncertain routine. Way Forward: This is the plan of action for reaching the goal. This should include steps which will allow the client to achieve the goal, such as in the case of weight loss, we can assume that the way forward can be; controlling the clients eating habits, forming a routine that he can follow and to motivate the client by indulging him in healthy foods and exercise patterns which he may enjoy. 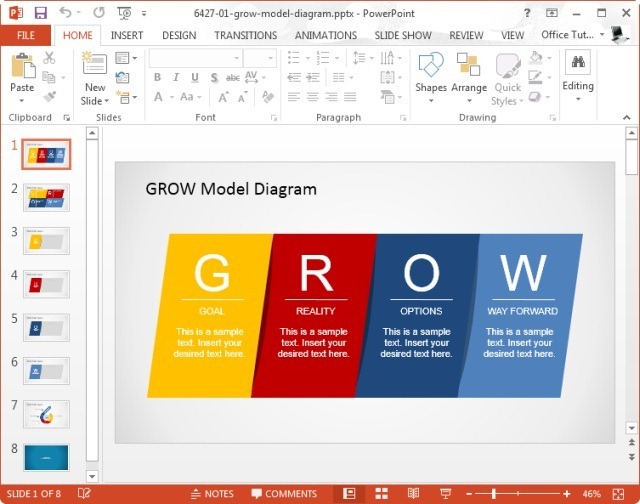 Whether you are a performance consultant or someone who wishes to incorporate the GROW model in your presentation, you can use this template to create professional looking presentations with the help of easy to edit slide layouts. 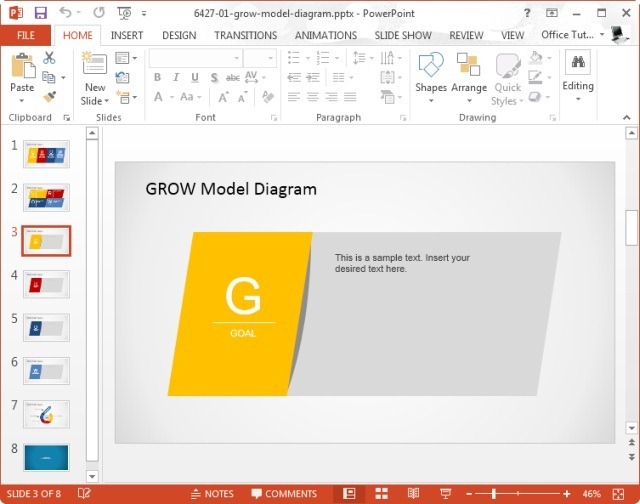 This PowerPoint Template comes with various sample slides which provide the utility to display your GROW model in the form of a single diagram, as well as to elaborate each part of the model in the form of individual slides. This template also provides ample content to allow you to create standalone diagrams for a GROW model with your own content, so that you might be able to present the Goal, Reality, Obstacles and Way Forward in the form of an easy to comprehend diagram. 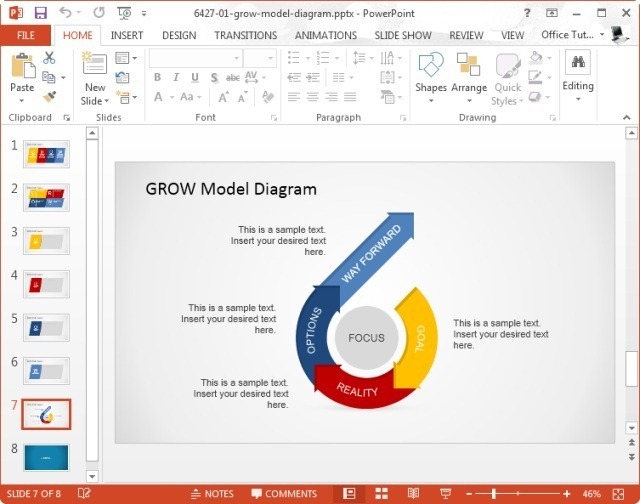 This template is highly customizable and you can edit all basic objects within each sample slide, as well as change the color and overall look of sample diagrams in PowerPoint. Tags: Business Plan Template, Business PowerPoint Templates, Business Presentations, Diagram Templates, GROW Model.